Not so long ago, hamsters, gerbils and mice were the only rodents kept as pets. Now the variety of rodents and the increasing popularity of these small creatures kept as pets has grown considerably. 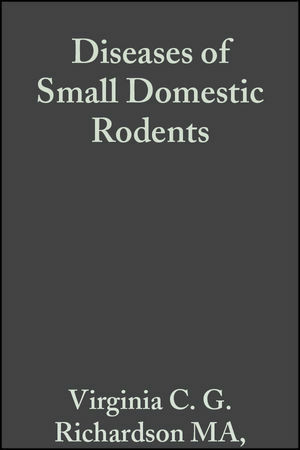 Since the last edition of Diseases of Small Domestic Rodents, two more rodents have been added to this book and become favourites among pet owners – the degu and the jird. As well as two new chapters on jirds and degus, this book has been fully revised and updated to reflect current developments in the treatment and knowledge of diseases in small rodents. With specific sections on anaesthesia and detailed information on drug treatments, Diseases of Small Domestic Rodents is the definitive reference book for students, breeders and practitioners alike. Virginia Richardson runs a small animal practice in partnership with her husband Ean, within which she has a specialist small pet rodent unit. Since a child she has always kept a variety of pet rodents, and this book is written from her experience as an owner, as well as a veterinary surgeon. 3. Anaesthesia and drug treatments. 6. Anaesthesia and drug treatments. 9. Anaesthesia and drug treatments. 12. Anaesthesia and drug treatments. 15. Anaesthesia and drug treatments. 18. Anaesthesia and drug treatments. 21. Anaesthesia and drug treatments. 24. Anaesthesia and drug treatments.